Since the demonstration of color vision in honey bees 100 years ago by Karl von Frisch, appetitive conditioning to color targets has been used as the principal way to access behavioral aspects of bee color vision. Yet, analyses on how conditioning parameters affect color perception remained scarce. 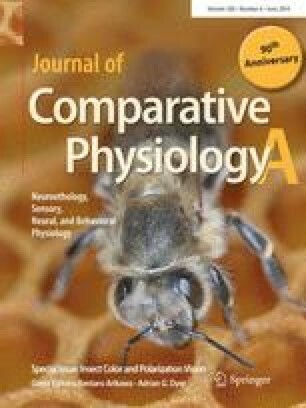 Conclusions on bee color vision have often been made without referring them to the experimental context in which they were obtained, and thus presented as absolute facts instead of realizing that subtle variations in conditioning procedures might yield different results. Here, we review evidence showing that color learning and discrimination in bees are not governed by immutable properties of their visual system, but depend on how the insects are trained and thus learn a task. The use of absolute or differential conditioning protocols, the presence of aversive reinforcement in differential conditioning and the degrees of freedom of motor components determine dramatic variations in color discrimination. We, thus, suggest top-down attentional modulation of color vision to explain the changes in color learning and discrimination reviewed here. We discuss the possible neural mechanisms of this modulation and conclude that color vision experiments require a careful consideration of how training parameters shape behavioral responses. We thank two anonymous reviewers for comments and corrections on a previous version of this work. This work was supported by the French National Research Agency (ANR; grant MINICOG to M.G.) and the Human Frontier Science Program (HFSP). Martin Giurfa thanks the Institut Universitaire de France, the French Research Council (CNRS) and the University Paul Sabatier of Toulouse for support.